In this review, we look specifically at connectivity Sonos, but the Rialto 400 would work equally well with any quality device with a digital output. So that non-Sonos users are not totally lost, I’ll explain briefly the Sonos products referenced in the review. CONNECT (formerly ZP80/ZP90). This is a streaming device with line level or optical outputs. It has no amp, so requires either powered speakers or an external amplifier. CONNECT:AMP (formerly ZP100/ZP120). This is a streaming device with 2x55w into 8-ohm amplifier. It n drive speakers directly. 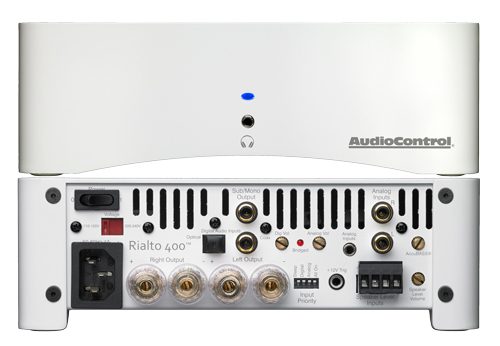 The Rialto 400 is an amplifier and high quality DAC, in a diminutive package measuring 8.5” wide, 2.9” tall and 5.4” deep. The amplifier delivers 100 watts of power per channel into 8 ohms and 200 watts per channel into 4 ohm loads. It can also be bridged to perform as a mono-block amplifier. According to Rialto’s literature, the DAC is a “high-performance Wolfson® DAC that drastically improves audio quality allowing digital and analog audio-systems to perform with better speakers across the home”. On paper, the Rialto 400 is the perfect audiophile match for any streaming device with a digital output. (It does have analog inputs, but I can’t foresee many situations where it would make sense purchasing the product if you’re going to bypass its DAC.) AudioControl really pushes the Sonos connection, but the Rialto 400 would be equally at home, for example, in a system where content is streamed via AirPlay using an Airport Express/AppleTV and its optical output. The product carries a 5-year warranty, which means the company is prepared to stand behind the quality of the product. It is available in Satin Black or Sierra White. The Rialto 400 is available from authorized dealers at a suggested client price of $799. The device has a surprising array of connections for its size. Controls: Digital gain, analog gain, AccuBASS level, Speaker gain, Mono/Stereo mode (for bridging mode), Ground isolation, Input priority setting. SMART input priority. This allows the unit to prioritize the signal from either analog or digital sources. For example, the unit could be connected to a Sonos CONNECT via digital and a TV via analog. If priority is set for analog and the Sonos is playing when the TV is switched on, the input will automatically switch to analog. There is also an all-on mode for when the user/installer is confident that no two sources will be playing simultaneously. Multiple gain controls. As the Rialto 400 has no volume control, the volume needs to be controlled by the source device. Having multiple gain controls allows sources to be level matched and to set the maximum output to the speakers. AccuBASS. This boosts the bass at higher volume levels and claims to “rejuvenate the bass response lost in most digital compression schemes and brings it back to the signal path. This results in a richer and fuller audio performance with better bass and mid-bass response often missing in today’s compressed music”. Despite the myriad of connections, controls and features, there are a few things that seem to be missing. Subwoofer Crossover. One glaring omission is the lack of any crossover control for the subwoofer. Without this, the full range signal will be sent to left and right speakers as well as the subwoofer. For those with truly, full range left and rights, this shouldn’t be a problem, but for people with bookshelf, architectural or in-wall speakers, it could be a major issue. No Preamp Outs. In my house, I have two CONNECT units, three CONNECT:AMPs and one PLAY:5. When a DAC and an amplifier is required (e.g. where a CONNECT:AMP would normally be deployed), one would simply deploy a CONNECT connected to a Rialto 400 via optical. In my media room, my fronts and subwoofer are used for music and movies, so they have to do double duty. What I really need here is an external DAC to feed the analog inputs on my receiver. Now I could just go and buy a different vendor’s DAC, but it would be nice to have the option to use the same DAC for all zones. With pre-amp outs, this would be possible and would allow me take advantage of the DAC. (It would be better if there was a DAC only version that cost a few hundred dollars less.) The lack of preamp outs makes it very difficult to integrate with my AVR. The only option I could see is to use the preamp outs for the front channels feed this into the Rialto 400. The Rialto would then drive my fronts and my sub for both movies and music streamed via Sonos. Presumably leaving the sub connected to the AVR would be fine. Not really an ideal solution. XLR. I was a bit surprised no to see XLR outputs. That said, I’m not sure where they’d put them. It’s rare that we’d ever talk about documentation in a review: it generally has to be really good or really bad to warrant any space. In this case, the documentation was well written, clear, and punctuated with good humor. Below are a few excerpts from the “small print”. People are confused by warranties! Lots of fine print. Months of waiting around. Well, fear no more AudioControl is here. This warranty is designed to make you rave about AudioControl. It’s a warranty that looks out for our customers, plus helps you resist the temptation to have your friend, “who is good with electronics”, try to repair your AudioControl product. So go ahead, read this warranty, then register the information at ww.audiocontrolregistration.com. The CONNECT:AMPs (formerly ZP100 and ZP120) have limited both power and are designed to drive 8-ohm loads. The CONNECT:AMP’s specifications are 2 x 55W at 8-ohms. If you have the need to drive 4-ohm speakers or need more the 55W per channel, clearly the Rialto 400 is a good fit without even looking at the DAC. I’ll preface this by openly admitting I’m not an audiophile (only for financial reasons), but I believe that I have a half-decent ear. Further, without having two identical speaker setups, a true A/B test isn’t possible, so it’s not 100% accurate. My normal Sonos setup in my media room comprises a Sonos CONNECT, a Denon 4311CI, Mirage Omnisat floor standing speakers, SVS PB13-Ultra subwoofer (a real gem). To test, I connected the sub and left and right front speakers to the Rialto 400 and hooked up the Sonos CONNECT via optical. Took me all of 3 minutes. I selected both Apple Lossless (uncompressed CD rips) and downloaded AAC files from iTunes. I started off listening via the Rialto 400. It sounded great, trebles were clear, bass was tight and punchy, but it didn’t seem that much better than my CONNECT and 4311CI. I reconnected the AVR and the speakers and played the same tracks through my usual setup: they sounded, well, tinny in comparison. The difference was night and day. So much so that I was sure I’d forgotten to connect something, had switched the polarity of a speaker, or had changed a setting on my AVR. After ten minutes checking and rechecking, I concluded I had not: the Rialto 400 is just that good. $799 is a good price for such a high quality DAC and amplifier, but it does cause the price of a Sonos system (especially a CONNECT:AMP upgrade) to escalate quite a bit. For a new install the math is easy: a CONNECT:AMP is $499, a CONNECT + Rialto 400 is $1,148, a difference of $649. Not a bad price to play for audiophile quality streaming. For someone with an existing CONNECT:AMP that wants to step up to a Rialto 400, on the face of it, it gets quite a bit more expensive, as the CONNECT:AMP has no optical out. This means the CONNECT:AMP ($499) needs to be replaced with a CONNECT ($349) and a Rialto 400 ($799), giving a total of $1,647, a difference of $1,148. This could realistically, be brought down to the $700-800 if the CONNECT:AMP could be redeployed to another location (saving a further purchase), or if the CONNECT:AMP were sold used. Sonos components have unbelievably high prices on the secondhand market, so a well-cared for CONNECT:AMP would easily bring in $300 or more, offsetting the majority of the cost of the CONNECT. For someone with an AirPlay setup, a $99 AirportExpress (or AppleTV) is all that’s required. For anyone looking to power a 2-channel or 2.1-channel speaker system from a device equipped with digital output, the Rialto 400, is great value and performs wonderfully. The combination of the Rialto 400 and a Sonos CONNECT brings the Sonos system up to audiophile quality (similar to the discontinued Squeezebox Transporter). Sonos should seriously consider OEM’ing this, adding their streaming technology, and selling it as a premium CONNECT:AMP. Mark has contributed over 50 articles to the eMagazine.